In a medium saucepan bring coconut milk just to boiling; reduce heat. Simmer, uncovered, for 20 to 30 minutes or until milk is reduced to 1-1/3 cups; cool. Meanwhile, preheat oven to 375°F. Line eighteen 2-1/2-inch muffin cups with paper liners; set aside. Using the tip of a small sharp knife, scrape out seeds from vanilla bean, set aside. In a small bowl stir together flour, ground nuts, baking powder, and salt; set aside. In a large bowl beat butter with an electric mixer on medium to high speed for 30 seconds. Add sugar. Beat on medium to high speed for 1 minute, scraping side of bowl occasionally. Add eggs, one at a time, beating well after each addition. Stir in half of the vanilla seed; reserve other half for frosting. Alternately add flour mixture and 1 cup of the reduced coconut milk (reserve rest of coconut milk for frosting) to butter mixture, beating on low speed after each addition just until combined. Spoon batter into prepared muffin cups, filling each about three-fourths full. Bake for 18 to 20 minutes or until tops spring back when lightly touched. Cool in muffin cups on wire racks for 5 minutes. Remove from muffin cups. Cool completely on racks. 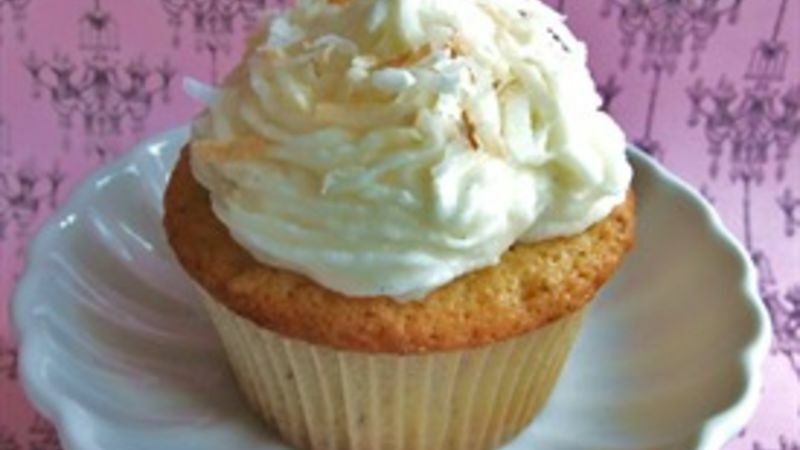 Pipe or spread Vanilla-Coconut Frosting on tops of cupcakes. Sprinkle with toasted coconut. In a large bowl beat 1 cup softened butter with an electric mixer on medium to high speed or 30 seconds. Beat in the remaining 1/3 cup reduced coconut milk, the remaining vanilla seeds, and 1/8 teaspoon salt. Gradually add 2-1/2 cups powdered sugar, beating until fluffy.